Make Booth #31 Your First Stop. Quality & Leadership give your business a competitive advantage! 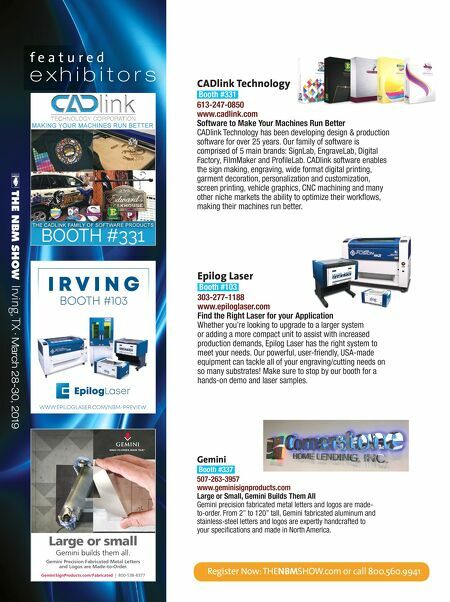 Visit us in Booth # 119 Get Empowered Build your business around a Trotec f e a t u r e d e x h i b i t o r s Irving, TX · March 28-30, 2019 Trotec Laser Inc Booth #119 866-226-8505 www.troteclaser.com Empower yourself with a Trotec Laser Whether you are starting your own business or looking to grow an existing business, Trotec can empower you with the capabilities, materials and support you need. The company's versatile CO2 and fiber flatbed lasers can cut, mark and engrave a broad range of materials at processing speeds up to 140 inches/sec., making them the fastest on the market. Combined with its comprehensive line of competitively priced engraving materials and expert support directly from the manufacturer, Trotec has everything you need to grow a business. Visit our booth and see how Trotec can empower you. JDS Industries Inc Booth #127 800-843-8853 www.jdsindustries.com Great Laserable Gift Items JDS helps you redefine gifts with their line of Laserable Leatherette or Cork items, Slate products and Polar Camel drinkware. Laserable Leatherette offers the look and feel of genuine leather while it stands up to the rigors of daily use. It lasers beautifully to black, gold or silver. Cork items also laser to a stunning black, and is one of the most highly renewable resources, which is a great selling point for the environmentally conscious. Polar Camels are perfect for any occasion; with double wall vacuum insulation they keep drinks hot or cold for hours on end. The powder coated colors laser to silver. Laserable Slate products offer a sturdy design with a contemporary look for something new and different and is also great for direct print. 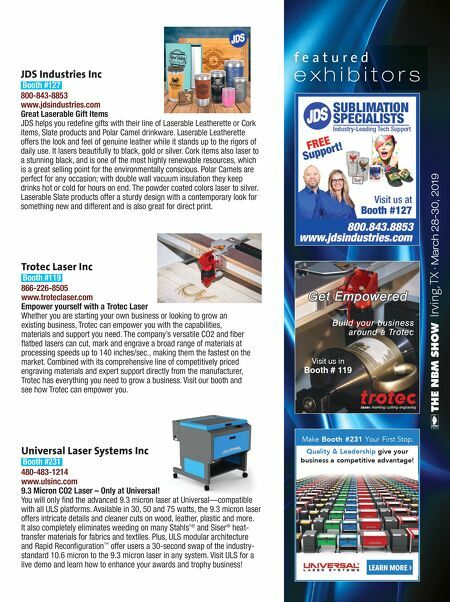 Universal Laser Systems Inc Booth #231 480-483-1214 www.ulsinc.com 9.3 Micron CO2 Laser – Only at Universal! You will only find the advanced 9.3 micron laser at Universal—compatible with all ULS platforms. Available in 30, 50 and 75 watts, the 9.3 micron laser offers intricate details and cleaner cuts on wood, leather, plastic and more. It also completely eliminates weeding on many Stahls' ® and Siser ® heat- transfer materials for fabrics and textiles. Plus, ULS modular architecture and Rapid Reconfiguration ™ offer users a 30-second swap of the industry- standard 10.6 micron to the 9.3 micron laser in any system. Visit ULS for a live demo and learn how to enhance your awards and trophy business!